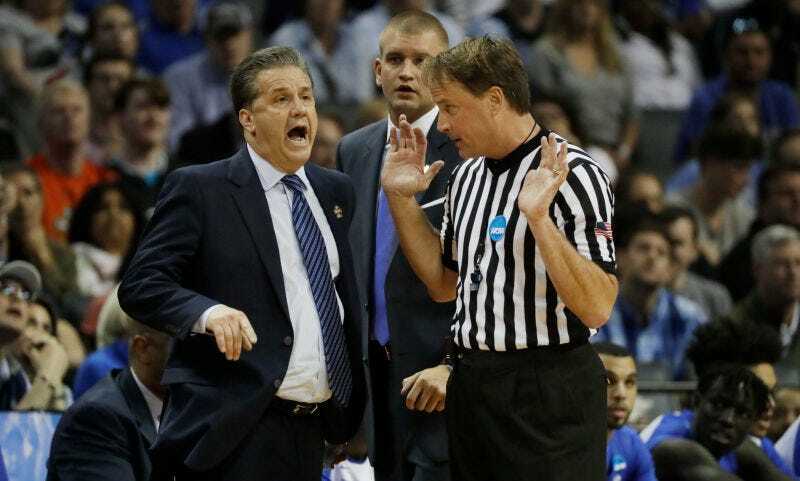 Men’s college basketball referee John Higgins is suing Kentucky Sports Radio, accusing the show’s hosts of sharing his personal information and encouraging angry Kentucky fans to come after him for his officiating in the Wildcats’s Elite Eight loss to North Carolina. Back in June, local law enforcement in Higgins’s home of Omaha announced that they had reviewed hundreds of voicemails he received from Kentucky fans and tagged several of them as violent or otherwise threatening for further criminal investigation. Today, Higgins filed a lawsuit in Nebraska district court against Kentucky Sports Radio and two of its employees, Matthew Jones and Drew Franklin. He alleges intentional infliction of emotional distress, invasion of privacy, tortious interference with a business—his roofing company, Weatherguard, which operates with the website www.rooferees.com—and civil conspiracy. Higgins claims that Weatherguard received more than 3,000 calls in the two days after the game, 75 percent of them from Kentucky area codes. Some individual numbers called as many as 40 to 50 times in one day, blocking actual business calls from getting through, per the lawsuit. Meanwhile, a flood of negative online reviews pushed Weatherguard from being the top-rated roofing company in Omaha to the last-ranked business in all categories. His 4.8-out-of-5 star ranking on Google became a 1.2, with 80 one-star reviews filed in a 24-hour period. (None of those reviews were traced to computers in the Omaha area; the majority were from Kentucky.) A total of 181 false reviews were ultimately discovered. Later that day, Franklin posted an article on the radio show’s website titled “No More John Higgins Please,” discussing his officiating. The next day, in a regular roundup post titled “Barleycorn’s Tuesday Top 10,” he noted that fans had been leaving negative reviews for Weatherguard: “John Higgins’ business is getting CRUSHED on its Facebook page. I won’t link the page because I don’t completely agree with attacking his side hustle, but, man, Big Blue Nation is destroying Higgins in the comments and reviews of the business.... If you can stand to watch it, here you go,” with a link to a video titled “John Higgins Sabotage of Kentucky” that showed a compilation of his calls from the game and ended with a picture of Higgins next to a truck with his roofing company’s name on it, with his business phone number and website printed next to it, as well as his home phone number and instructions to write a review of the company on Facebook with the right URL.